See all the new leaves…pretty sweet huh? Gasp! It is a terrible sight, I know. My tree has experienced a massive loss of leaves reminiscent of jungle trees in Vietnam sprayed with Agent Orange. Despite doing everything humanly possibly my tree has repaid my dedication by more or less dying. If you look carefully you can still spot a few leaves but I think it is only a matter of time before they also fall off. I think I know what I did wrong. 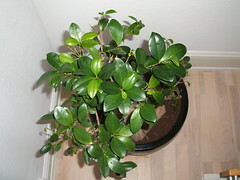 I planted my Ficus Bonsai in too big a pot which did not allow the water to draw from the bottom all the way to the top, watering all the roots. 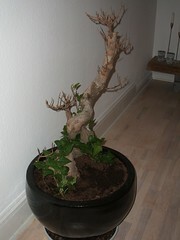 So what has happened is that 80% of the root ball has in effect dried out and died causing the massive loss of leaves. 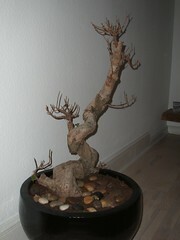 Since I spent a lot of money on my Ficus Bonsai tree I have decided to keep it even though it is dead. Today I bought some Ivy, planted them in the pot and gave the whole thing a shitload of water. The plan is that the Ivy should replace the leaves and make the tree look alive again. I will keep you updated with pictures along the way. On a more poker related note I just got busted out of a 10000$ tourney with A10. I raised preflop and did not hit the flop. My opponent checked and I made a continuation all in bet. He called of course having hit the flop…..sneaky bugger.